It’s true, we have a love-hate relationship with our frosty friend, winter. We love the excuse to stay in and shamelessly binge watch our fave Netflix shows but we dislike that it plays absolute havoc on our hair and skin. It’s snow laughing matter! Wrap yourself up in a faux fur and brace yourselves, because we’ve rounded up all the tips and tricks, from head to toe to keep you looking your gorgeous self this winter. It’s safe to say, our luscious locks bear the brunt of the winter weather affects. In the cool months hair becomes dehydrated, leaving it looking and feeling listless and dull. But, don’t despair, because here are some tricks and products that can help. Use an oil-based treatment: Essano Argan Oil Recovery Hair Mask works deep into the hair cuticle to treat dry, damaged and stressed hair. A perfect way to strip your hair of those winter blues! Use once a week. 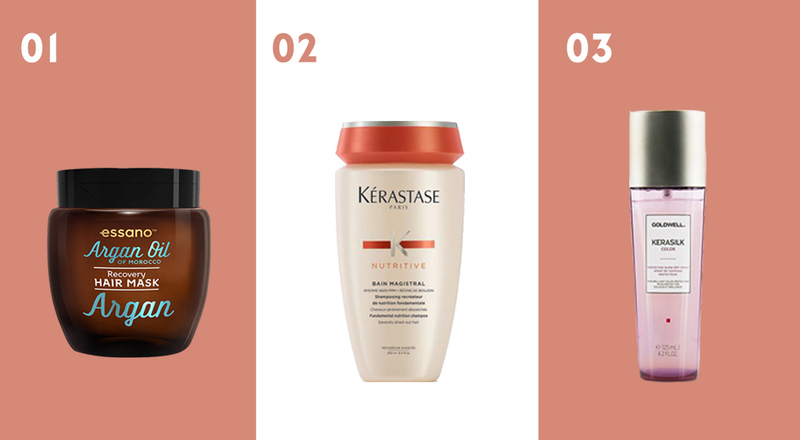 Use a hydrating shampoo: Kerastase Nutrive shampoo not only removes impurities but nourishes your hair, leaving it with a soft, radiant shine. Use a protectant: We rely on hair dryers and styling products during the winter months, so it is essential to use heat protectant. Goldwell Kerasilk Colour Protective Blow-Dry Spray is great for colour-treated hair providing heat and UV protection. This is a double bonus, helping your colour last longer while leaving your hair feeling soft and looking fine! If there’s one season taking the crown for its ability to insanely reduce hydration levels, it’s winter. 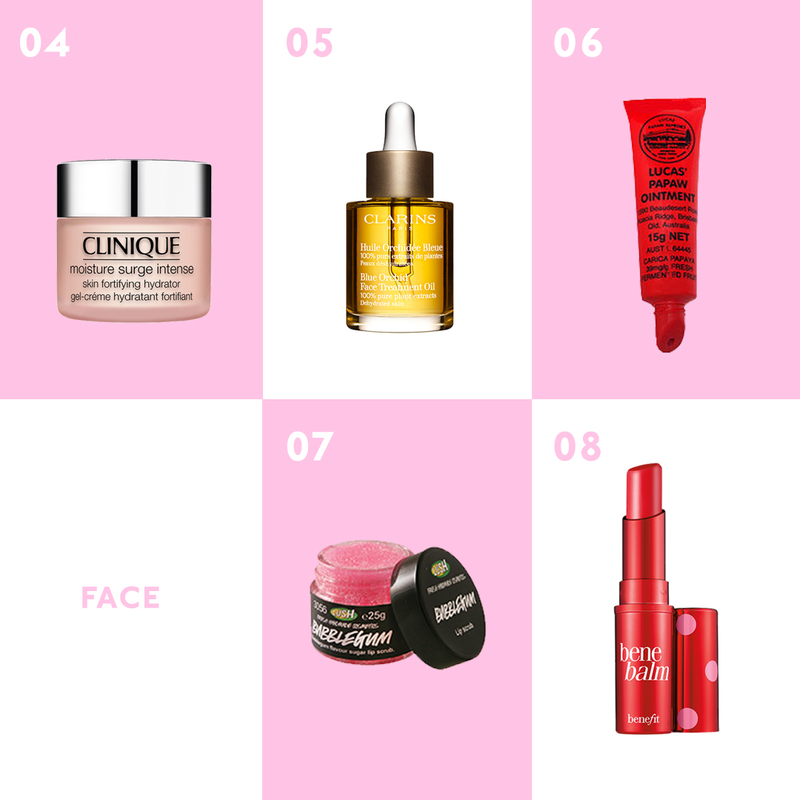 When it comes to looking after our face, moisture is the word to remember this season and here are some products that can help do just that. Use a hydrating moisturiser: The Clinique Moisture Surge Intense Skin Fortifying Hydrator helps to repair the skin barrier and ensures the skin stays hydrated and plumped. This nourishing face cream even creates a great base for foundation, a perfect way to start your makeup in the mornings during these colder months. Try using an oil: Clarins Blue Orchid Face Treatment Oil is perfect for all skin types, targeting dehydrated skin and loss of tone. Simply release a few drops into your palm and apply thoroughly to cleansed face and neck. You’ll sleep easy this winter, benefiting from the aromatic properties of the oil whilst it restores skin vitality and radiance. There’s nothing worse than going to apply your fave lippy just as your flying out the door and the cracks on your lips start to appear. No thank you! Here are some lip products to help protect your lips this winter. So, next time you go to apply your winter lippy, it’ll be a piece of cake! Use a product that incorporates barrier-like ingredients: Lucas Paw Paw is a versatile must have in your collection, thanks to the benefits of the fruit. It is formulated with that key ingredient beeswax, shea butter and vitamin E, just for those extra benefits. Use a lip scrub: Lush Lip Scrubs gently scrub away rough skin to keep lips looking smooth and feeling soft. Those lips will be prepped for that winter lippy in no time! Use a tinted lip balm: The Benefit Lip Tint Hydrator conditions and hydrates the lips while providing a subtle pop of colour. These lip tints provide a sheer, buildable colour that’s available in four shades. A makeup must have this season! It’s no secret that when the harsh months of winter strikes, the dreaded scales appear and we’re not talking about beautiful mermaid scales here! It’s time to get your exfoliating mitts and brushes out, accompanied by your fave scrub and shed those flakes away! Use a body scrub: The Grounded Coconut Coffee Body Scrub is a natural tropical body scrub packed with much-needed vitamins, minerals and anti-oxidants essential for glowing, soft skin. It’s ideal for the dry and sensitive skin we all experience during winter. Try a cream product: If you want something more gengle, the Body Shop’s Gently Exfoliating Cream Body Scrup is a delicate cream that will soften sensitive skin. Infused with real crushed almond shells, it will nourish your body like a dream. Put on a glove: Fake tan junkies, this one’s for you! The Bondi Sands Exfoliating Glove is a dual-action mitt that works to prepare the skin for a streak-free tan. The black side removes dead skin cells and fake tan residue, while the blue side removes any tanning errors. We’re all guilty of firing up those heaters as soon as the temperature starts plummeting and standing under those piping hot showers a little too long. Little did you know that these guilty pleasures of warming our souls can have a negative effect on our skin. It’s time to lather your skin up and restore that moisture, these products can help! Butter up, baby: The Body Shop’s intensive creamy all-over coconut body butter absorbs easily into the skin. This body butter contains ingredients that are derived from coconut oil, working to condition and soften the skin and restore that lost moisture our good old friend winter causes. Use a body cream: The Dermalogica Body Hydrating Cream has an advanced body cream formula that works to condition and soften the skin. The non-greasy emulsion absorbs easily and provides you with immediate results. Try a body oil: The Linden Leaves Gold Body Oil is enriched with amaranth oil to help hydrate the skin and improve moisture retention. You’ll be left with a soft radiant glow and healthy, younger looking skin! What more could you ask for? Gone are the months of tan lines and naturally bronzed skin. Luckily, thanks to fake tan you can forget about having to jet set off to the tropics to achieve that natural glow. Make it fast: The Bondi Sands Express Self-Tanning Foam provides an enviable sun-kissed glow in just one hour! With intense hydration and ultra-lightweight foam that absorbs fast into the skin, there’s no need to worry about that dreaded sticky feeling! For a light-medium colour leave tan on for half an hour and for the darkest colour leave on for up to two hours. You’ll be a bronzed goddess in no time! Take it slow: The Bondi Sands Everyday Gradual Tanning Milk keeps your tan looking fresh while hydrating and nourishing the skin, delivering a natural, golden tan. Use a mitt: The Bondi Sands Self-Tanning Mitt is a reusable application glove that makes bronzing up that much easier. Use to achieve a streak-free tan while protecting your hands from those unsightly stains! If fake tanning just isn’t for you, don’t worry, we’ve still got you covered! Here’s where to find Auckland’s best spray tans. Don’t forget about your hands! Our hands are equally important when it comes to locking in that much needed moisture during these colder months. 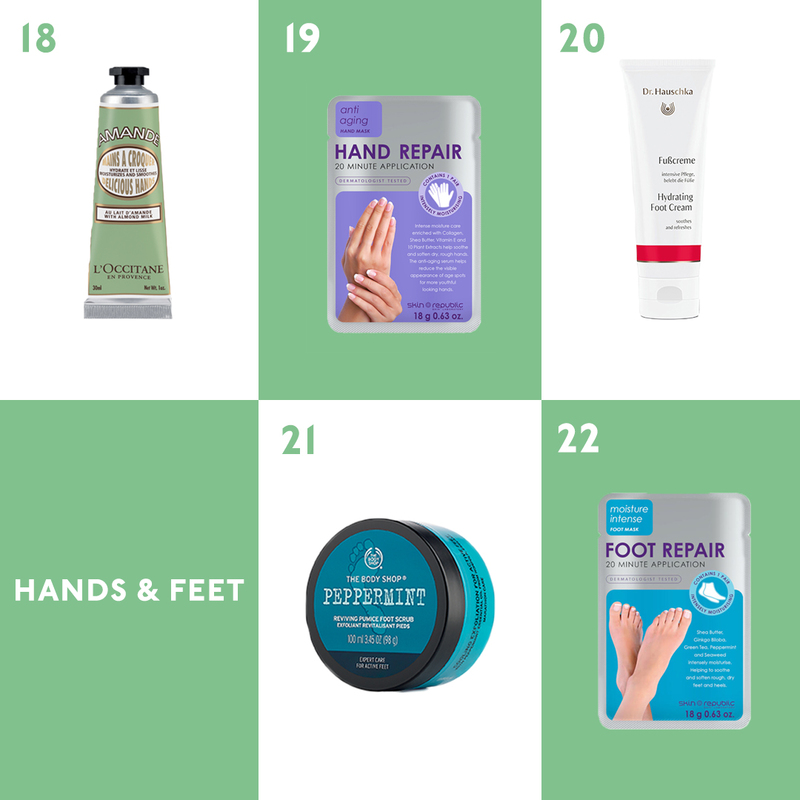 Here are some much needed products so you can wave dry hands goodbye! Love the cream: L’OCCITANE Almond Delicious Hands is a non-greasy hand cream that has been enriched with almond oil and milk to nourish and soften those leathery hands. Try a hand mask: The Skin Republic Hand Repair is a glove treatment that works to soften and rejuvenate dry, rough hands. This 20-minute hand mask is formulated to minimise the effects of sun damage, reducing pigmentation and the visible signs of ageing. Although our feet may be hidden in the warmth of our winter woolies the entire season, we can’t forget about treating our feet. Creamy goodness: The Dr.Hauschka Hydrating Foot Cream is ideal for daily foot care, with a creamy consistency that is quickly absorbed, providing intense moisture. Simply apply to the feet after exercise or a long day and enjoy the results. Scrub it up: The Body Shop’s Peppermint Cooling Pumice Foot Scrub is an exfoliating foot scrub with volcanic rock granules to work away rough patches of hardened skin. Your feet will be left feeling soft, smooth and scented. Try using a foot mask: The Skin Republic Foot Repair is a foot mask treatment formulated to soothe rough dry feet. In just 20 minutes, you’ll be left with baby soft feet! Glass Skin | WTF Is It And How Do We Actually Get it?